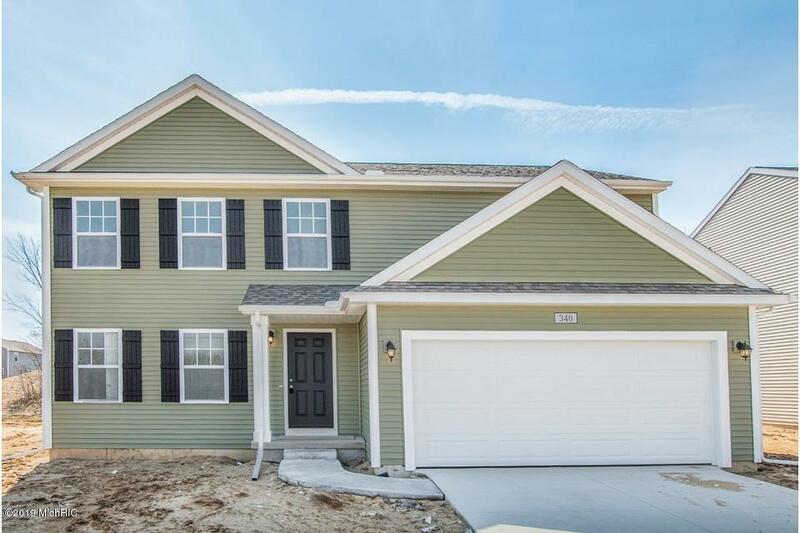 New construction , available May 2019, 4 bedroom, 2.5 bath home in Prairie Run North, in the heart of the dynamic Cedar Springs area, just a short 5 minute drive from US 131. There are many choices for grocery shopping, pharmacies and fast food restaurants. The community is also within minutes of the White Pine Trail, library and Cedars Springs schools. RESNET ENERGY SMART NEW CONSTRUCTION, 10 YEAR STRUCTURAL WARRANTY. Entertaining or enjoying a night at home, this open floor plan has space foreveryone. Large great room is open to the dining nook and kitchen. Kitchen features castled cabinets, center island and stainless steel; dishwasher, range and microhood. Easy access from kitchen to mudroom, with built in bench and laundry room. Powder room completes the main floor living space. Upstairs a master suite with a private full bath and large WIC, along with 3 more bedrooms and another full bath create the upper level. Patio creates an outdoor space. Powder room completes the main floor living space. Upstairs a master suite with a private full bath and large WIC, along with 3 more bedrooms and another full bath create the upper level. Patio creates an outdoor space.